I like this question. This is my definitive litmus test for blind dates. If someone can give me a well-reasoned argument behind their superpower, whatever it may be, then they pass muster. If they come up with something on the fly, and follow up with a shoulder shrug, *shakes head sadly* then we probably aren’t compatible. This question judges both creativity and higher reasoning skills. Both are necessary for a successful relationship with me, romantic or otherwise. I usually receive ordinary answers to this question: the power to read minds, flying, superhuman strength, etc. Every once in a while, I’ll get a really cool answer that makes me stop and reconsider the person beside me. The best answer, by far, was one guy who mentioned that he’d love to have the power to make his beard hair grow at will. He’d not only be able to grow the best hipster beard around, but he’d be able to use the hair like an extra appendage. This would be super beard hair! It would be super strong and helpful in a pinch. He’d be able to have a third hand, protect loved ones from projectiles, and even catch someone in his pillow-soft beard if they were falling. It all sounded awesome!! I don’t know if he made up the answer right then, or if he’d seriously put thought into this before, but he had such good ideas and well-reasoned uses for this power that I was amazed. Why it didn’t work out with that guy is a mystery, and probably another story. Some of my favorite books are sci-fi and fantasy. I’m sure that the superpowers and magic described so enticingly in novels are where I got the idea for my litmus test. Magic is such a seductive idea. It’s beautiful and bold, and so counter to the science of our everyday lives. Magic also serves my wish for instant gratification. Sign me up! I so admire authors who come up with fully-realized worlds. It must be difficult to come up with a realm in which the magic or superpowers follow strict rules and yet make logical sense to a reader. You have to have some serious creative juices flowing to craft something so intricate! Also, the morality of the positive or negative uses characters choose when wielding such power is incredibly interesting. It’s also one of the reasons I ask my little question: to see what kind of person my interviewee is. If the why behind their superpower is solely for personal gain, then I judge them to either be selfish, or perhaps feeling poor in some area of their lives (money, love, time, friendship). If they put a little mischief in their answers, then I instantly like them more. This means they have a good sense of humor and know how to both give and take a joke. If they come up with something really off the wall, then they’re either making something up on the spot (possibly bad) or their minds work in complicated and strange ways (good). Making something up on the spot isn’t necessarily a bad thing if it’s well-reasoned, and they’re good at thinking on their feet. However, if they’re just talking and not taking me seriously and are trying to come up with whatever they can just to move the conversation along, then it’s a bad thing. It means we don’t connect on a quirky level, like random conversations about superpowers. I’d have the power to start and stop time at will. While time is stopped, I’d still be able to maneuver about the world as normal. This would allow me more time in a typical day for naps, travelling distances in what appears to be the blink of an eye to everyone else (I’d never be late again! ), and I could be the best photographer of all time! Also, I could use my power for much mischief. Bwahaha! I could move things just out of reach when you thought you had something in your grasp, or move a person in front of a closed door when they were attempting to walk into a building. I could also pause an especially heated argument to come up with an even better comeback than whatever I was about to say. It’s a fun question that I’ve put to good use. I love that reading has helped feed my innate creativity. So tell me, what would your superpower be, and why? 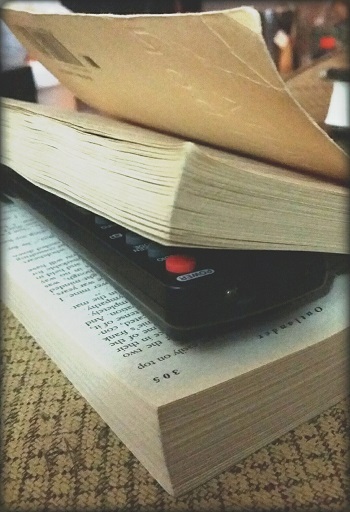 As a book lover, I have no shortage of bookmarks. I have cute ones, thoughtful ones, and even quirky ones. Sometimes none of them will do, or (a more likely reason) I’m in a hurry to mark my page, and need something, anything, now. I know that there are lots of readers who love to batter their paperbacks, but I’m not one of them. I can read a book just as well while keeping it looking nearly new. And that way it’s still looks pretty on my shelf after I’m done. So tell me, what are some strange bookmarks you’ve used? While I am a devoted and constant reader, I generally only read one book at a time. More precisely, I only read one novel at a time. If I’m reading many books simultaneously it’s because I’m wrapped up in a novel, and I’m casually reading one or more non-fiction books. Novels are engaging and I love to lose myself in them. It’s harder to do when reading multiple works. I feel I can’t be fully present in the story with another one nagging at me. It takes away from the experience. Non-fiction is different. It’s not an engaging story, and can usually be broken up into bite-sized pieces. Of course there are exceptions to this, and for those non-fiction books that read like novels, I treat them the same way as I do any other fiction- one at a time. I know many people who operate differently, who like to juggle many stories at once. I suppose I could do this too, if I so chose. But why bother? For me, it would prevent fully immersing myself in any one novel. I would lose the escapist quality that is so seductive to me about reading fiction. Please weigh in with your thoughts. One, or many? Why?